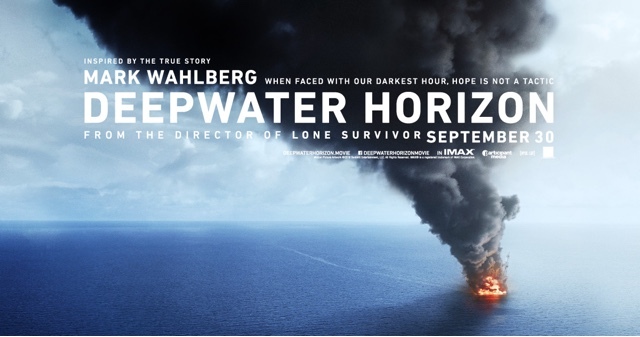 Deepwater Horizon is a new film by director Peter Berg starring Mark Wahlberg, Kurt Russell, and Gina Rodriguez, amongst others. This film dramatizes the events that occurred on the ultra-deepwater semi-submersible offshore oil drilling rig Deepwater Horizon in late April of 2010 when a build-up of pressure inside the pipes caused a blowout, a massive explosion, and (over time) the worst man-made environmental disaster in U.S. history. This film is highly effective at engaging the audience and having something to say about the situation specifically on the rig. Laser focused, Berg delivers a really successful product early in this fall movie season. To avoid burying the lead, the best thing about this film is its third act and eventual finale. As an audience who had intimately absorbed the news just six and a half years ago of what happened on this rig we all knew where it was going. When it went there and how it delivered what happened was awesome. Horrific, undoubtedly, but awesome. The sheer intensity, the direction of that sequence, and the performances across the board deliver, and were absolutely gripping. Truly, this was the most tense and all engrossing sequence I have seen in a film this year. As the events on the rig unfold, it was really hard to believe what you were seeing, yet it retained enough realism (as it is based on a true story after all) that every moment was jaw dropping. Moreover, the film never backs down from showing the horror. It doesn’t hide from the bad things that happen to people which I thought was a genuine strength in the movie. The film also nails its ending. No spoilers obviously, but I will say that it leaves the audience right where they ought to be emotionally given what they have witnessed throughout the film’s final act. This was bold and I think it really worked out for Berg and left me feeling like this was an incredibly excellent film. Another great thing this film does is getting you to care about the characters. In the beginning of this movie we’re introduced to them slowly and we all know exactly where they’re going and the trials they are about to face. Instead of feeling complacent, however, this film ties you to certain connections and feelings you can understand that make the end of the film even stronger. Wahlberg’s and Rodriguez’s characters, in particular, are extremely well developed and it was very easy to back them throughout the course of the film. The last praise I want to offer this film is how effectively it managed to tell a one-sided story. Berg has a point of view about the event and he isn’t subtle about it. At first, this definitely bothered me. Not because of any personal feelings I had, but rather because I think the inability to present all sides in ways you can understand their choices shows poor filmmaking skills. By the end of the film, however, when you’ve been put through the ringer by the events of that final act you are in a position to fully appreciate the perspective brought to the making of the film and you can’t help but agree, at least in part, with the decision to tell this as a one-sided story. The real problems with this film come in the first two acts. Although this film isn’t long (just 99 minutes), that introductory portion of the movie felt laborious. The film does cut that slow build with certain emotional scenes and some pretty clever humor to keep the audience somewhat engaged. However, I still found myself sitting there waiting for something to happen. Even though I thought the characters were all nice and they were setting up certain points of conflict on the rig I got the point of those quickly and this film dragged into getting to that brilliant conclusion. The film doesn’t have any other major negatives. It has a couple weird shots that did not look good on screen. It doesn’t explain certain parts of the drilling operation that could have helped in understanding what would happen. It has some secondary characters that it doesn’t develop well enough for you to get terribly invested in. That’s about it. Overall, Deepwater Horizon is a tremendously effective film that leaves the audience with a powerful emotional gut punch following a stellar third act. Many films cannot survive off a great third act alone, but Deepwater Horizon is one that can and does as many of the issues experienced earlier felt less harmful to my overall impression of the film because of how strongly it closed.